Young-adult fiction just isn’t my jam. I was looking for something to read with more ‘adult’ themes (i.e. the characters have jobs, no coming-of-age self-discovery, romance subplots that contain more than the protagonist over-analyzing whether or not they should kiss the love interest, and so on). How do I keep messing up? Clearly, I need to stop purchasing books from my Kindle, since the sales page doesn’t show the categories for each book. Terry is the product of a successful science experiment. He’s a genetically altered human who is immune to Variant, the poisonous gas covering the surface of the earth. When two of his peers escape from the underground city where the rest of humanity lives, Terry and a team of his classmates must go to the surface and recover the missing teens. Meanwhile, Terry’s mother Mara gets involved in politics and becomes the Matron, which is the leader of all the mothers. Although she’s upset that her son has been taken away for school and she won’t see him again until he graduates in ten years, she has no trouble moving on and focusing all of her energy on politics. I was pretty disappointed by this book since it didn’t really hit the dystopian mark. I’ve read a number of novels with underground societies (heck, I’ve even written one—check out The End of Refuge), and most of the appeal of these books is discovering how the unique settings work and what they look like. But the city where Terry lives gets no description. I don’t know if it looks like the interior of a building, or if each space is carved out of the rocks and dirt. There’s a mention of farms, but no other indication of how the plants get light and what these people’s diet consists of. And why do they have a large military when there are no other groups of people to be their adversary? There is some world building once the teens are on the surface. The sky is purple, the grass is blue, the buildings are in ruin. For some reason it takes their group several days to traverse four miles, because that’s apparently how fast humans walk. They give up on finding one of the missing classmates after a grueling fight with some alien monster. Well, they don’t give up, more like the author forgot that was the only objective for the group while up on the surface. Also, I really hated when one of the rescuers declares that the research building could blow up—with no reasoning behind her prediction—and then the rest of the book just follows this assumption, ending with the building blowing up. None of the characters were particularly complex, and the narration spent too much time in Terry’s head. Mara’s storyline gets abandoned the last third of the book, and there’s no resolution for any of the plot threads there. I totally understand why people liked this book. It’s an enjoyable read with clear language and a storyline which flows well from scene to scene. The minimal descriptions would appeal to some readers. However, I wouldn’t say that this is hard sci-fi. 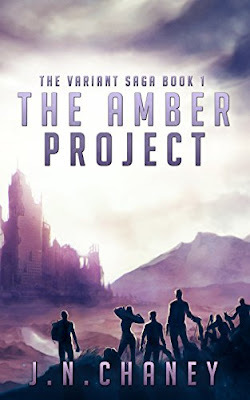 If you enjoy post-apocalyptic stories with a touch of conspiracy, you should check out The Amber Project. Check out all of my book reviews!